of mentors, in their fields. Are you interested in mentoring or be mentored? The Mentoring for Change program assists internationally trained professional newcomers in their settlement process, language skill development, and search for professional employment by matching them with suitable mentors. Settlement and language mentoring helps identify resources for new Canadians and assists with improving their communication skills. Mentoring for employment provides support and assistance to internationally-trained professional newcomers to overcome the barriers they face in their search for suitable employment. Up to 70 per cent of participants in employment mentoring gain employment in their fields. Are highly motivated and committed to looking for work in their profession in Canada. Mentoring available for entrepreneurs through the Newcomer Entrepreneurship Hub. Newcomer Entrepreneur Hub focuses on the entrepreneurial spirit of newcomers and assists in breaking down the barriers to successfully obtaining employment and/or establishing a business. 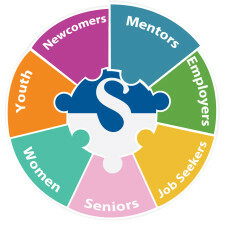 The Newcomer Entrepreneur Hub will be an incubator for newcomers to start their businesses and will provide participants with access to computers, meeting space, coaching and on-going supports from a mentor to ensure that the appropriate referrals and connection are made to increase the success of employment or the start-up of a business. For more information, click here. Eligibility criteria: PR, Convention refugees ,etc. ; previously owned a business and/or is interested in learning how to start a business in Ontario; English level CLB 4/5 or higher. Hear from our Mentors and Mentees themselves! To participate in Skills for Change’s mentoring program, and if you qualify for the program, you can register directly here. Be sure to discuss this opportunity with a counsellor, who will assess whether mentoring is right for you and register you with the program, or register via our e-mentoring portal. A mentor can clarify your expectations, talk candidly about what you need to succeed, and in many cases, introduce you to great new people. Employment: We partner you with a mentor who will support your career development through a one-on-one relationship. An employment mentor can help you build a network of contacts and gain local insights into your profession. Language: An English language mentor will give you a chance to practice and improve your language skills. Our mentors have an excellent command of the English language. Settlement: Mentors can help you navigate Canadian culture and everyday life in Toronto, and introduce you to community resources while improving your communication skills and self-confidence. Our mentors are established professionals with a minimum of 2 years of experience in their fields in Canada. They are also open-minded and enjoy interacting with mentees who have come from around the world to make Canada their home. Skills for Change welcomes professionals who want to volunteer their time as a mentor. We host orientation sessions for mentors to get them started. You can register for the program directly via our e-mentoring portal. We welcome individuals from all professional backgrounds to become part of the mentoring program. Get involved in a rewarding volunteer experience. Mentoring includes professional development, language skills, and helping newcomers settle into a new life in Canada. Mentoring takes as little as one hour per week over four months. Meetings can can occur at a mutually convenient time and place. If distance or schedule makes in-person meetings difficult, mentoring is also very effective via telephone and online. We also hold regular mentor orientation evenings and encourage you to attend one of our information and orientation sessions for mentors. You will learn more about becoming a mentor, strategies for a successful mentoring relationship, and you will meet mentors who will share their experience with you. Start your own Mentoring Program! Skills for Change has developed a curriculum and process manual that is used in our Mentoring for Change program and for external training. We offer “Train-the-Trainer” workshops and will customize mentoring modules to suit your organizational needs. For more information, please contact our Mentoring Specialist, Rosaline Graham at rgraham@skillsforchange.org or 416-658-3101 ext. 264. Join us for an upcoming mentoring event led by Softchoice, one of North America’s leading providers of IT solutions & services. Softchoice Human Resource team will speak about career in IT Hardware and Software, Sales, Business Analysis, Marketing & Operations, and more. SoftChoice team will also share resume and interview tips, and lead sessions on job search tools.